H&R Ford Fiesta | H&R Special Springs, LP. Ford has a track record of observing trends, listening to its customers and delivering a vehicle that exceeds all expectations. The 2011 Fiesta, with its contemporary looks, exemplary fuel economy and high tech features is no exception. Since its introduction, more than 500,000 Ford Fiestas have been sold in Europe and Asia– markets in which H&R Special Springs has already established a dominant position with its premium high performance suspension products. With that in mind, Ford’s all-new Fiesta, modified with H&R Special Springs components and select aftermarket products designed to optimize the Fiesta’s attributes, made perfect sense. 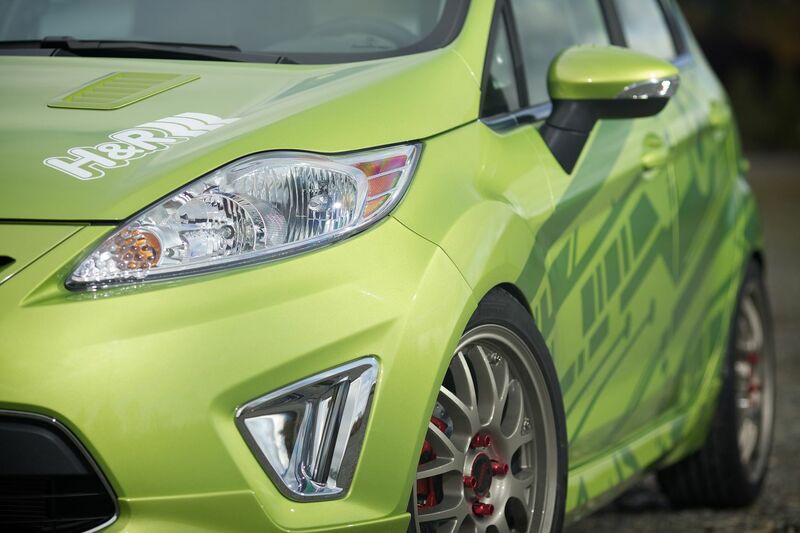 Because ride height and appearance are of particular importance to the Fiesta’s demographic, H&R fitted the Fiesta with H&R Street Performance Coil Overs. H&R Street Performance Coil Overs deliver crisp handling and a compliant ride, as well as the ability to lower ride height anywhere from 1.0-2.5 inches to suit the user’s sense of style. Each H&R Street Performance Coil Over is application specific and features a custom-valved, threaded shock paired with a precision-engineered progressive rate spring to create a finely tuned suspension system. 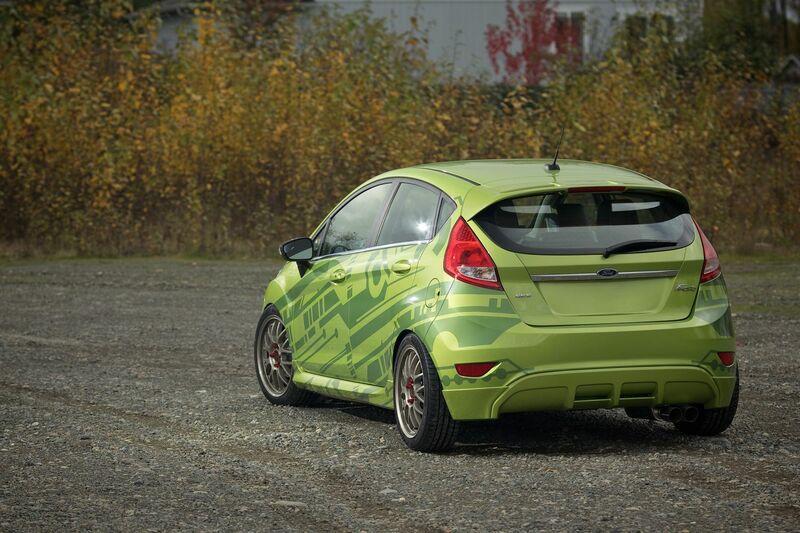 17x7” ASA AR3 wheels from The Tire Rack were custom painted bronze to compliment the Fiesta’s vibrant Lime Squeeze green paint, then shod with 205/45 R17 Pirelli PZERO RTF tires, also from The Tire Rack. To achieve the perfect track width and aggressive, European stance, the Fiesta was also fitted with H&R TRAK+ hub centric wheel spacers. Available in widths ranging from 3 mm to 65 mm, TRAK+ wheel spacers are made from a proprietary aluminum/magnesium alloy and allow customers to minimize the unsightly gap between tire and fender, whether using stock or aftermarket wheels. H&R ‘Triple C’ camber adjustment bolts, meanwhile, allow the user to dial in exactly the right amount of camber for improved tire life and better tracking. 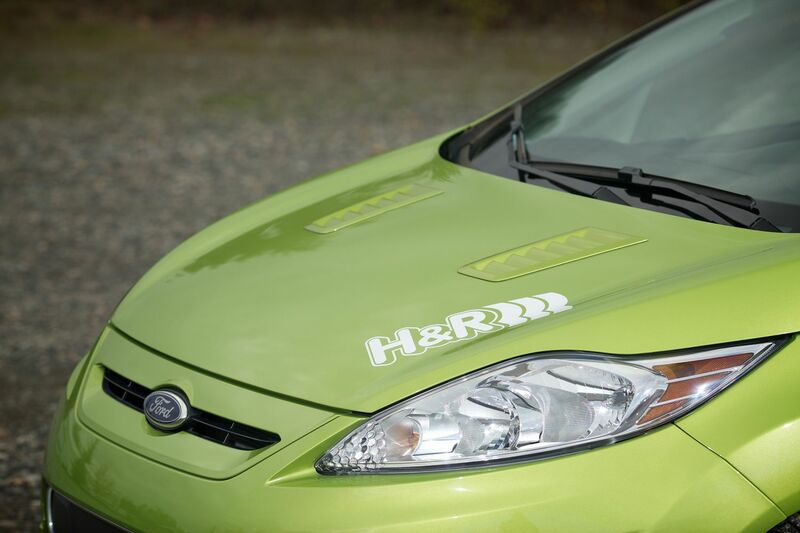 Under the hood, the Fiesta features an FS Werks strut tie bar for added rigidity, as well as an FS Werks air intake system and ignition wire set. The high-performance cat-back exhaust system, also from FS Werks, provides increased performance and muscular sound from the Fiesta’s energetic 1.6 liter DOHC inline four. The system terminates in dual, polished stainless steel tips, adding another clue to the car’s performance potential. Baer DecelaRotor brake rotors increase braking capacity for track day events. 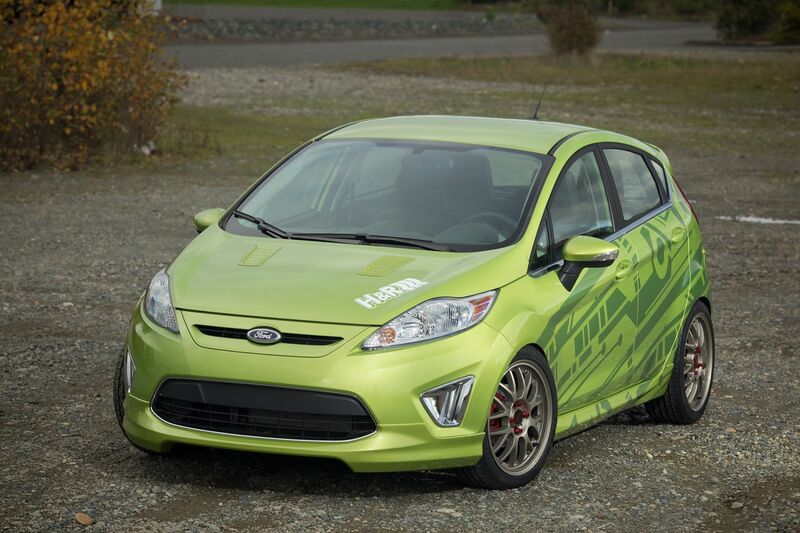 The Fiesta’s factory paint was retained, but its kinetic design aesthetic was enhanced with a Ford rear wing, color-matched 3D Carbon body kit and custom Euro hood vents. 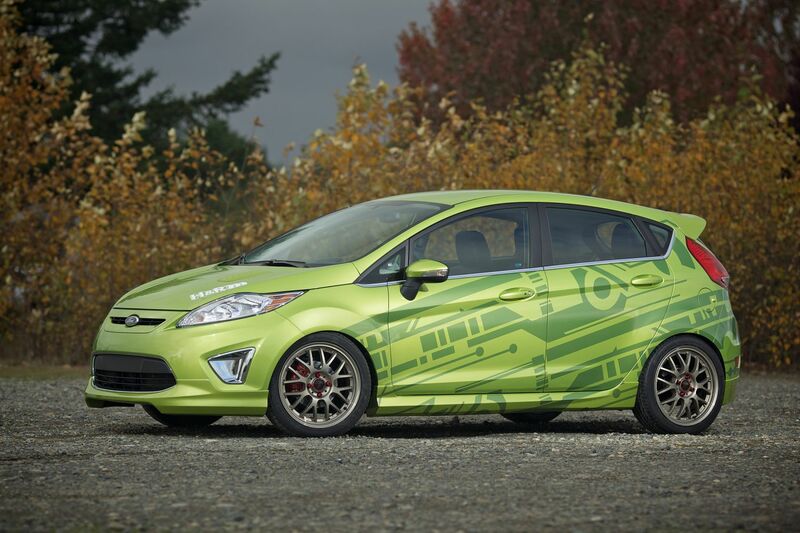 Sticky Jewel Graphics wrap around the Fiesta’s belt line and convey motion in high tech, metropolitan style. 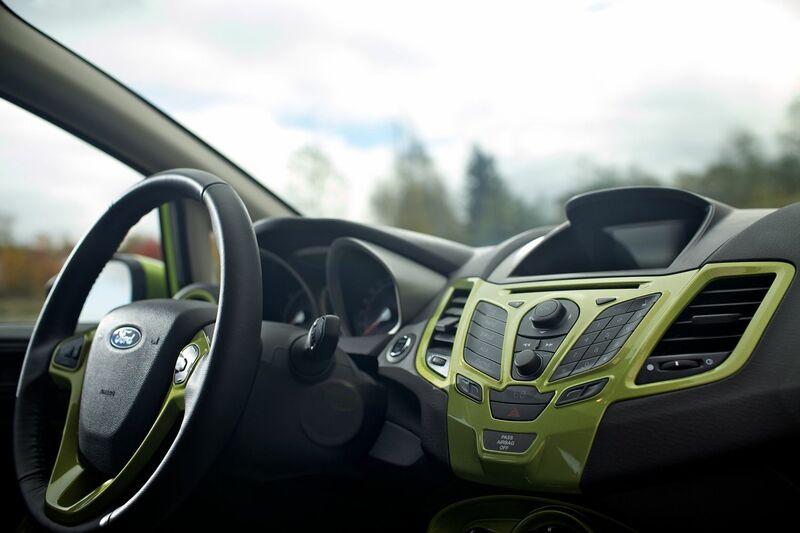 Inside, the Fiesta’s boldly sculpted surfaces are augmented by a custom painted center console, dash and door panels that match the exterior color. 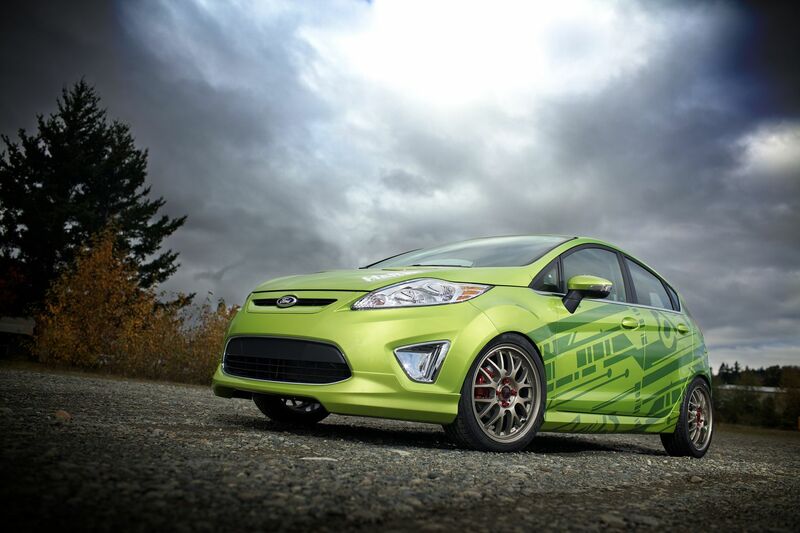 MacNeil Automotive floor mats provide functional benefits, protecting the Fiesta’s interior from dirt and grime. The Ford Fiesta is a fun and affordable platform for the enthusiast–and as this project demonstrates, a very versatile one, as well.